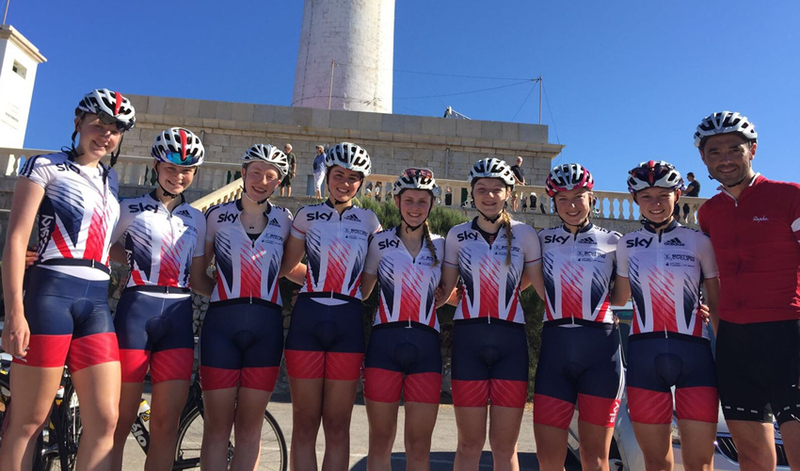 Manon Lloyd (third from right) with British Cycling Senior Academy. When Manon Lloyd lines up at the European Track Championships this week, it will be the third time she has pulled on the Great Britain kit at a European Championships in 2016. Lloyd who turns 20 in just over two weeks claimed the team pursuit title at the Under 23 European Championships in July to add to her under 19 title from 2014, before riding the European Road Championships in September. All coming after a fractured sacrum in April threatened to derail Lloyd's season for the second year in a row, having suffered a fractured pelvis a year earlier. Undeterred Lloyd fought through the disappointment to ride the Aviva Women's Tour before earning selection for the Under 23 European Track Championships. A gold medal around her neck in the team pursuit allowed Lloyd to tick off one of her big goals for 2016 and go from strength to strength. Another Women's World Tour Race at Ride London followed by the European Road Championships, something she credits as a learning experience for the future only continued a successful season. This week Lloyd will aim to complete the set of European titles with an elite victory to go with her under 19 and under 23 success. Early November will then see Lloyd compete in her fifth World Cup in Glasgow but this week she has her focus firmly on the European Championships, where she will race alongside Olympic Champions Elinor Barker and Katie Archibald and under 23 European Championship teammates Emily Nelson, Danielle Khan and Emily Kay. Back on the British Cycling Academy for the third year in a row looking forward to the year ahead? I'm over the moon to be back on the Academy for the third year, I've learnt so much in the last two years, and it has given me so many amazing opportunities to race and gain experience against the best bike riders in the world. I'm really looking forward to the year ahead with some new girls on the academy. Selection for the Elite European Championship what dose it mean to be named in the Great Britain Team for your third European Championship in 2016? It's an honour to have been selected for my third European championship of the year and at the start of the season I never thought I would have been selected to race at three of them. Though I had not had an amazing start to the season I am really pleased to be on my way to my second track championship and to have been selected for the road euros was a massive surprise. I may not have got the result I wanted at the road championship but I learnt a lot from the experience. To have been selected for my first elite track championship as an under 23 is another big step up for me, and I'm looking forward to what the team and I can do against some of the best teams in Europe. GB is sending a mix of youth and experienced what are you most looking forward about racing alongside Olympic champions Elinor Barker and Katie Archibald? I have not raced in the same team as Katie and Elinor before so this is something I am really looking forward to, and as they are both now Olympic champions I am looking forward to learning a lot from them. Have raced World cups before but this will be your first elite championship what do you think the biggest challenge will be? For me personally I don't think there will be any challenges different to the under 23 championship. We all know what we have to do. We do it day in and day out. Different track but still 250m, we aren't going out to try and do something we haven't done before. All four of us know what we are capable of and we are going to stick to what we know. If we go back to April you had a fractured sacrum at the Energiewacht tour and had over a month off the bike did you ever think the second half of 2016 would see you ride two World Tour races, claim an Under 23 European Title and be selected for European Road and Elite Track Championships? Having a month off the bike in the middle of the season is not something I had planned for 2016, after a pelvis fracture in 2015, and again having a lot of unneeded time off the bike in the middle of the season. But having the fracture so close to the under 23 championship did worry me a lot and I did think at one point that I wouldn't be going. But I came back so much stronger after my injury and I had really good form for the Under 23 championships and the rest of the season. The women's team pursuit has been added to the 2018 commonwealth games and the Madison at the World Championships important step forward for women's cycling? Yes this is something I am really excited about, I think the team pursuit will be a really good opportunity for team Wales as for a small country we have so many strong up and coming track cyclists. The Madison is another step forward for women's track cycling it's a race I've never raced, but would love to have a go. I think GB will have really strong riders looking to have the chance to race Madison at the World Cups and World Championships. Big changes to the omnium have also been announced with the timed events removed and four bunch events held over one day. What do you think of the changes? Something that suits you? I haven't had the chance as yet to experience the new format, but I will be watching the new omnium format here at the European championships. I think it will be better racing for spectators to watch, as timed events can be pretty boring, and having four bunch racing will be a lot more exciting. They've cut it down to four bunch events with one new race introduced the 'tempo' which will be interesting as no one has ever raced it before. I think the new format will be better for me personally as the timed events weren't my strong point.